Sportive lemurs are active at night, when they forage for food, and less social than brown lemurs or sifakas, tending toward solitary living. During the day, they doze in tree hollows, crooks, and dense areas of branches, usually alone unless they are raising young. 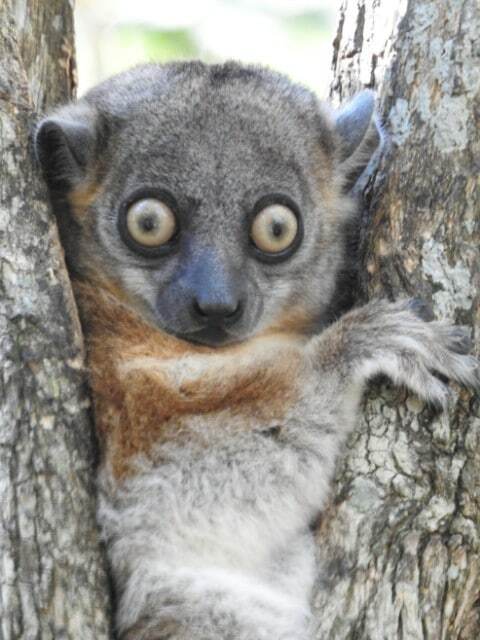 With their large, night-adapted eyes, sportive lemurs wear a perpetually surprised expression. Our guides at Zombitse National Park led us to members of two species of sportive lemurs hanging out in tree crooks — Zombitse and red-shouldered — as well as two family groups of Verreaux’s sifakas. The red-shouldered lemur in this photo is awake during the day, but that does not mean our guides did woke it up. Like many animals, sportive lemurs sleep lightly, waking on and off throughout their sleeping cycle (think of cats). There’s some amazing wildlife at Zombitse and excellent guides, but it seems to be one of Madagascar’s lesser-visited parks. We were the only group scheduled to visit it all day, which is a shame. Parks tourism supports conservation efforts and the local economy. When people can earn income by working at the parks or selling goods and services to parks visitors, they become personally invested in preserving fragile ecosystems. Constantly threatened by slash-and-burn agriculture, Zombitse needs that kind of local support.